Our employees wear tshirts by FedbyThreads. Each shirt we purchased feeds a family in need. 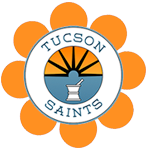 Tucson SAINTS believes in giving back. We have always been a huge advocate of giving back to our veterans community and Americans in need. We participate in community events, volunteer, and donate to several organizations in the United States. We are proud to announce that we have partnered with another local Tucson company that believes in giving back, too. (https://fedbythreads.com) A local Tucson organization that is the first national chain of sweatshop-free American-made, organic, sustainable, apparel and custom print/embroidery that feeds Americans in need. Feeding Jobs: American Garment workers can feed their families from good jobs! Feeding The Hungry: We go out ourselves into communities to feed people. Feeding The Earth: 99% of our inventory uses organic sustainable materials. Our employees wear Fed by Threads shirts, and now you can, too. Proudly, we were able to provide 507 meals by the shirts we purchased. We are giving our patients the opportunity to join us by not only wearing a comfortable, stylish, shirt, but also the knowing that you, too, are helping those in need by Giving back. 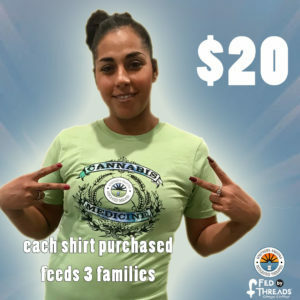 Our earth green shirt is available to purchase by visiting our dispensary. Cost: $20, 3 meals given to feed an American family.